The Leader line continues to grow with the launch of the new LEADER 46. The Leader 46 revisits the same key points that have made the current line an international success – a high-performance hull, generous exterior spaces and innovative interiors. This flagship model goes even further by offering a sporty look, luxurious spaces and unparalleled finish. 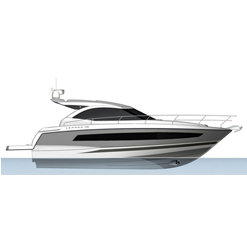 The new LEADER 46 carries the same DNA of the line, making a statement with a sporty hull designed by J&J Design. The design owes her sleek profile to the talents of Garroni Design. Available with IPS propulsion or stern drive, the new Leader 46 offers superior quality performance and seakeeping abilities. black finish. To the fore, the comfortable sundeck invites relaxation, complete with a mattress with adjustable backrests. 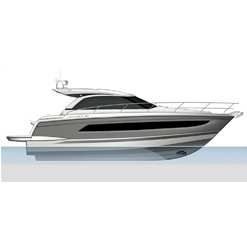 Particularly destined for cruising, an optional aft folding glass panel allows for closing or fully opening the sport top toward the aft. Luxuriously zen, the interior design of the LEADER 46 will seduce you with her contemporary spirit that has been carefully studied down to the smallest details (wide windows in the hull, new design for furnishings, indirect lighting, new materials…). Innovative and unexpected, a true owner’s suite is a pleasant surprise, with her superb central cabin (centreline berth) and a king-size, modular head with separate shower compartment. The guest cabin and private head with separate shower compartment offer the same luxurious details and overall comfort (berths may be separated, copious storage). The comfortable saloon with sea views faces a first-rate galley that is particularly serviceable. 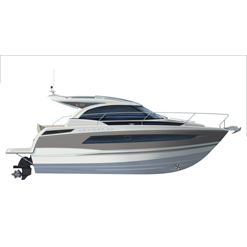 Fully modular, the Leader 46 is also offered in a 3-cabin version that is particularly well adapted to the closed sport top version. The LEADER 46 has been designed for those who love speed, high-performance cruising, comfort and the simple pleasures of life aboard.